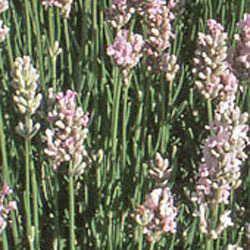 This cultivar of English lavender has light pink flowers. It is identical to the cultivar 'Jean Davis', which is a name often seen in nurseries. Slightly taller and lighter in color than 'Hidcote Pink'. The calyx color is green; the corolla is light pink. Categories: all potted plants, butterfly nectar plants, deer resistant, fragrant plants, lavender plants, Potted Plants, More..